Vancouver is known in religious circles for being a very secular city in a secular province in an unchurched part of the continent. According to researchers at the Angus Reid Institute, only 17 percent of British Columbians attend church as often as once a month – lower than Canada’s overall rate of 23 percent. Unofficial observers estimate that the numbers are even lower in Vancouver. Ed Searcy, the longtime pastor of University Hill Congre­gation of the United Church of Canada, thinks this trait has a long history: “Look at why people first moved here. It wasn’t for God. It was for money.” The economy of western Canada has always been one of boom and bust, where wealth is based on gold, timber, or oil – or, as is lately the case, property. Vancouver was once an inexpensive beach village, but between hosting a World Expo in 1986 and a Winter Olympics in 2010, the city remade itself into a great metropolitan region. Surrounded by spectacular scenery, it is known worldwide for its urban livability. On the culture front, British Columbia is the California of Canada: marijuana laws are looser, hippies and retirees flock here (sometimes they’re one and the same), and the ocean and ski slopes offer enticing alternatives to being in church on Sunday morning. The way British Columbians approach whale sightings, exercise, sushi and indigenous art may suggest that religion hasn’t disappeared here – it has only found a new form. In What Happened to Christian Canada?, Mark Noll notes that in the period just after World War II Canadians were actually more religious than Americans. No one is quite sure why a steep drop occurred, but the decline of the United Church of Canada is part of the story. Phyllis Airhart, in A Church with the Soul of a Nation, chronicles how the United Church was created in 1925 by a merger of Methodists, Congregationalists and (most strands of) Presbyterians in hopes of offering “friendly service” to the nation. Airhart says that for 40 years the United Church focused on shaping a Christian Canada, and in the early 1960s it could feel satisfied with its numerical strength. The next generation focused on diversity, expressing shame over Christians’ treatment of indigenous peoples. Now the UCC worries about empty pews and unused buildings. In other words, as Christendom collapsed, a church that was built on Christendom collapsed too. In Vancouver as in many other parts of the Pacific Northwest, there is no ecclesial “home team” in the way that Lutherans predominate in parts of the Midwest or Baptists pervade the South. The United Church, the Presbyterians and the Anglicans all have historically great congregations that offer vibrant ministries, but none can claim dominance. All mainline denominations struggle to catch what might be the new wind of the Spirit in Cascadia: Asian immigration. British Columbia has taken in thousands of Chinese from Hong Kong and from the mainland of the People’s Republic. About 30,000 Chinese immigrants have entered Canada every year since 2000, amounting to 15 percent of all immigrants to Canada. It’s estimated that by 2031 there will be 800,000 Chinese in Vancouver – a quarter of the city’s population. Though Vancouver offers some of the rockiest terrain for churches in North America, some vibrant things are happening on the ground. A lot of that vibrancy is connected to immigration. Some of these immigrants have found their way to West Point Grey Baptist Church. West Point Grey is one of the neighborhoods that has changed the most in recent years. Its mid-20th century modest housing stock is worth 10 times what it was when built, and its streets are dotted with luxury cars. Some of the immigrants arrived as Baptists. New members early on started a cooking class at church so that new arrivals from Asia could navigate Canadian grocery stores and learn how to cook macaroni and cheese. The leaders called the class Cross Cultural Cuisine and expected maybe 10 people to show up. Thirty did, and the numbers kept growing. Two hundred people signed up for the class on cooking a turkey dinner at Christmas. And the class developed an element of mutual exchange: the Asian-Canadians taught Anglos how to cook dumplings. Pastor Matt Kitchener says the group draws lots of mothers of small kids whose husbands are back in China on business. Just because these households have money doesn’t mean they have no needs – including the need for friendship. A report by the Vancouver Foundation in 2013 found that most people in the city can’t name more than two neighbours. In serving this population, the church has found a renewed sense of mission. Copyright © 2016 by the Christian Century. 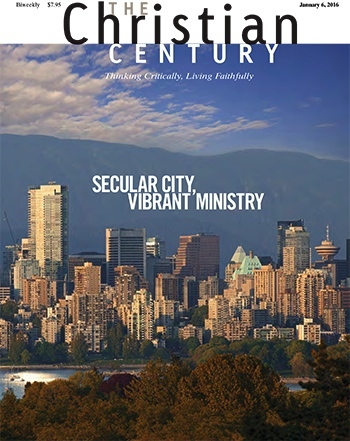 ‘Vancouver’s stony soil’ by Jason Byassee is excerpted by permission from the January 6, 2016, issue of the Christian Century. To read the full article, click here. It is well worth carrying on; the two-thirds of the article not posted here includes insightful portraits of Ken Shigematsu and Tenth Church, Tim Dickau and Grandview Calvary Baptist Church, and Ron Reed and Pacific Theatre. 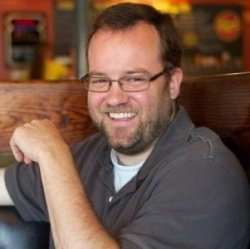 Jason Byassee recently began teaching at the Vancouver School of Theology. Jason Byassee is a man of several parts, and a quick study. He only came to Vancouver last summer, to scout out the area and set up a home for his family, in preparation for his new role teaching homiletics and biblical interpretation at the Vancouver School of Theology. His previous day job was as senior pastor of the 1,500 member Boone United Methodist Church in North Carolina. But he also taught at Duke University, where he earned his PhD in 2005. He was assistant editor of the Christian Century from 2004 – 2008, and has written scores of articles for a range of publications, including Sojourners and Christianity Today. He has written and edited several books, with two more on the horizon. Byassee will be an asset to the church in Vancouver, and as an interpreter to the wider world. I enjoyed reading this article. I know Ed Searcy and Reginald Bibby and I have been to Duke University with my late husband Gordon Turner. As the widow of a clergy man who was the senior minister at St. Andrew’s-Wesley United Church who served on the national church’s team for evangelism, I know the challenges Jason Byassee faces. Duke University has Duke Chapel and a long history of being church. Vancouver is extremely secular. I’ve just published a book entitled The Ecumenical Affair and I have found even within churched circles people do not know what ecumenical means. They may have heard of Jesus of Nazareth. But few would be able to realize or even imagine that Jesus of Nazareth was the local psalmist and not the renowned Teacher, The Magdalene spoke with face to face in the garden adjacent to the tombs. So your article was welcome news. It reminded me of the importance of starting with a simple meal and it has given me an idea. Thank you. Thanks for highlighting this Flyn. Jason’s appointment at VST is good news for the church and for the city. I welcome Byassee to Vancouver. I expect he will become a great asset to our Christian community. I have long realized that the losses Canada’ mainline churches are suffering, especially the United Church, is due to their Christendom foundation. Such a foundation is similar to sand and is bound to fall apart in due time. Of course, they can be revived and get a fresh start. I never accept the term “post-Christian” as a description of the Western world, for we cannot know the plans of the Holy Spirit. It may be that no one quite knows why the entire church in Canada lost members. I was abroad for many years, but as I observed the Canadian church from afar, I had a strong feeling that while the “mainstream” churches with their Christendom foundation had little to offer the people, most of the “other side” of Protestantism was too fundamentalist and also had little to offer the nation. In recent decades, the Evangelical “side” has woken up to some degree and now participates more fully in national life with a distinctive voice, even having established Christian post-graduate institutions like Trinity Western and the Institute for Christian Studies in Toronto. As to Vancouver being kind of a hick town before Expo 1986, I was not here, but I find it hard to believe. The powers that be would hardly have awarded the privilege of hosting Expo if it were such a minor player.